As we’ve already seen, the neck is a one-piece mahogany item taken from a Gibson ES-345 semi-acoustic, and it’s been fitted very well. 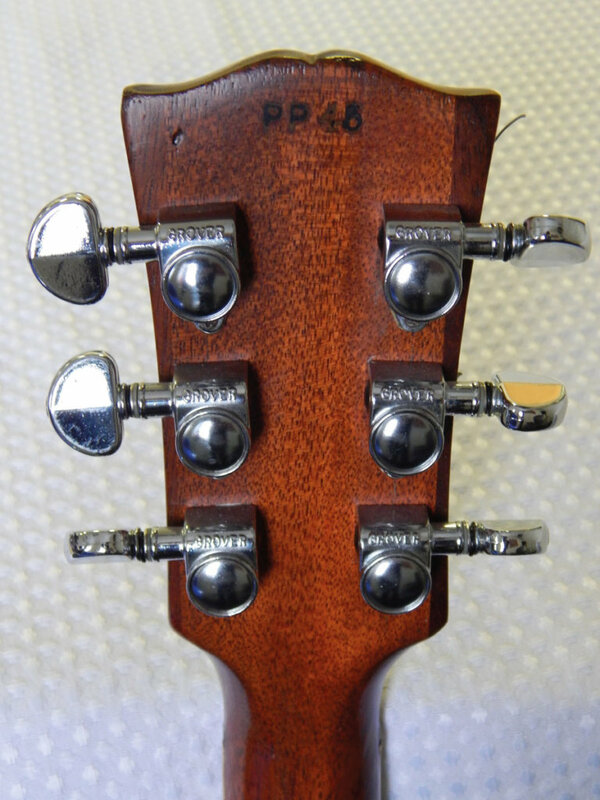 The headstock did carry its original ‘crown’ inlay in the ’70s, but on the treble side, where some damage occurred at some point, the headstock repair has resulted in the whole of the front being re-sprayed to black, and thus the inlay has been lost. It’s a little hard to understand why it couldn’t have been kept; there are a number of ways to get around the problem, but the repair is nicely done. In the early days the back of the neck was darker in the machinehead area, but today it is all the same colour. The neck measures 41mm at the nut and 51mm at the 12th fret. The rosewood fingerboard is in good condition and the distinctive double parallelogram inlays are nicely cut. A re-fret has taken place, and the frets are thin and low with just a little wear making them flat on the top. Dave tells us that the zero fret was fitted at the same time as the re-fret instead of replacing the original bone one. There is some buzzing coming from the B string because the nut at the back of the fret has not been cut deeply enough, so the string hits the top of the fretwire as there is not enough string pressure coming off it. The nut really is only a guide for the strings, but it should be cut to allow the strings freedom when a zero fret is fitted. With permission granted from Dave, I decide to a little work on this and clean it up. The tang under the fretwire seems to be behind the edge of the fingerboard and glued with the nut, which I don’t think looks good, and nor is it best practice. A return to a bone nut would be perfect here and would restore the original spec. The other point is a zero fret on open chords would make the sound somewhat brighter because of the metal instead of the bone. The John Birch bridge/tailpiece was added around 1973. The current saddles are modern. Having oiled the fingerboard, the rosewood has a lovely dark chocolate look to it and feels much better. Truss rod adjustments are not needed as the clearance is just right, although the action in my opinion is a little too low to achieve clear ringing notes. 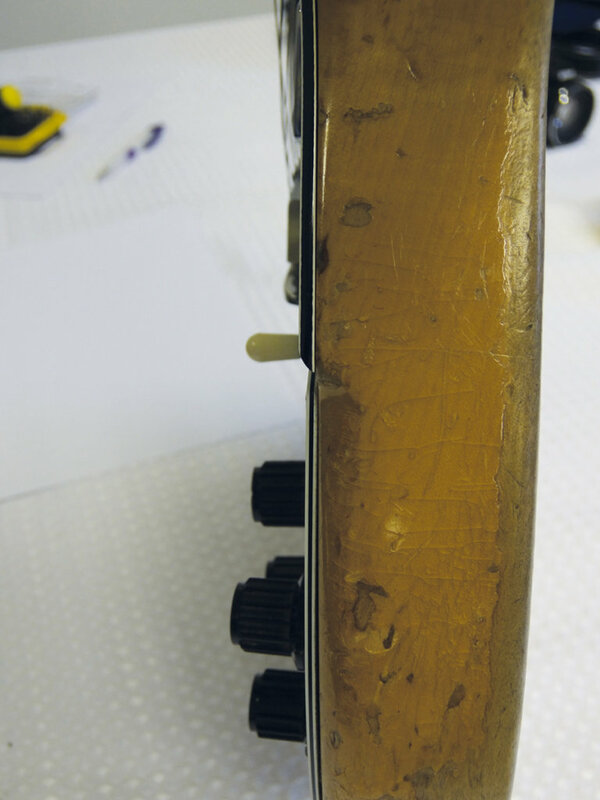 This could be due to the slight fret wear, but a simple fret dress would sort this out. The Grover machineheads feel smooth to turn. Sometimes people over-tighten these via the small screw at the end, thinking that it helps to stop them from slipping, but it doesn’t; the screw is there to adjust the torque so that it feels comfortable to turn. I’ve taken the screw completely out of a Grover in the past to test it, and it still stays in tune. John Birch guitars started in Birmingham around 1970, its founder members being John Birch, Arthur Baker, and John Diggins – who later went on to produce Jaydee Guitars. They had some very clever switching on their guitars for the time. John Birch would advertise the parts he made, such as pickups, and also offer his customisation services. 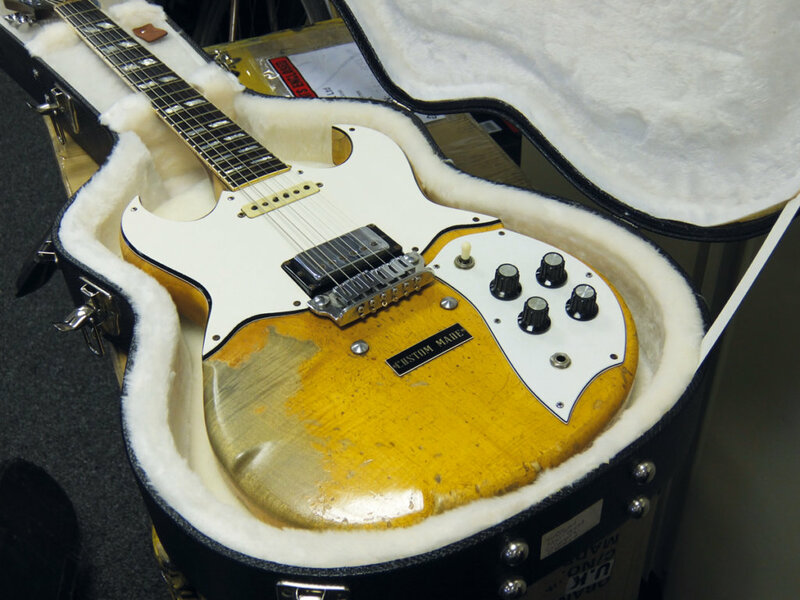 In March 1973 a new bridge, made of stainless steel and designed to replace Gibson’s Tun-O-Matic bridge and tailpiece, found its way onto this guitar and was first seen at Slade’s Earls Court gig. This very sturdy item had brass pillar inserts with stainless steel caps to cover the top of the studs. Individual saddles with height adjustment are supplied, and the steel plate they sit on – which is about 1/8th of an inch thick – delivers maximum transference of string energy. A ‘John Birch’ inscription is stamped into the steel plate, and just at the back of the bridge on both treble and bass sides is a number that looks like possibly T or C 258, which could make this one of the very earliest ones made. Judging from their condition, the current saddles would seem to be recent ones. Also, on the bass E string side of the bridge, the adjustment screw for intonation is slightly oval. At the back of the saddles, secure springs hold them in place. Back in 1968 Dave’s guitar was fitted with Gibson bonnet reflector knobs in black, with a metal toggle in the lower part of the control panel and a jack socket placed higher up. Then, around March 1973, when the current John Birch bridge was fitted, the look changed, with silver-skirted control knobs similar to those you might see on an old Carlsbro amplifier. By the time of Slade – Live in Winterland San Francisco gig in April 1975, the lower control knob had become smaller, with a small fin at each end, and one control had been lost altogether. This gig shows a great performance by Slade and really showcases Dave Hill’s fast vibrato and control. By 1976, all the knobs were different again. After this the guitar was not seen much for a time, as Dave was using John Birch guitars and various others. Then, in 1991, Slade released Radio Wall Of Sound, and on TOTP the guitar could be seen with an extra smaller knob, an idea possibly based on the Rickenbacker blender knob. The controls at the present time are a little taller and have small grooves on the shafts, but still have chrome reflectors. Interestingly the three-layer plastic control plate is slightly thinner than the main scratchplate, and the toggle switch is also higher up. As we take the rusty screws off the control plate to see underneath, the first thing to be noticed is that the wires used for both pickups is the wrong type. The humbucker has a brown cable with a blue and braided wire coming out of it: this is soldered to the lower volume control, which is a 500k pot, connected to the tone control with what looks like a Fender .02 ceramic-type capacitor. The neck pickup has a grey-coloured plastic wire that has a red and blue wire coming out of it – something like you’d see on an old table lamp – again connecting to the tone control with the same capacitor. The potentiometers are unmarked, but of good quality: they could be Centralabs, but the middle tag doesn’t look familiar. They look as if they’ve been in place since 1968, but they’re of good quality, and the shafts don’t move from side to side like some cheap ones do today. A new jack socket has been fitted, and the whole area has been foil-backed, albeit rather patchily. Earlier we mentioned the suggestion by people who knew Sam Li that wiring was not his strong point… and now we can see why. 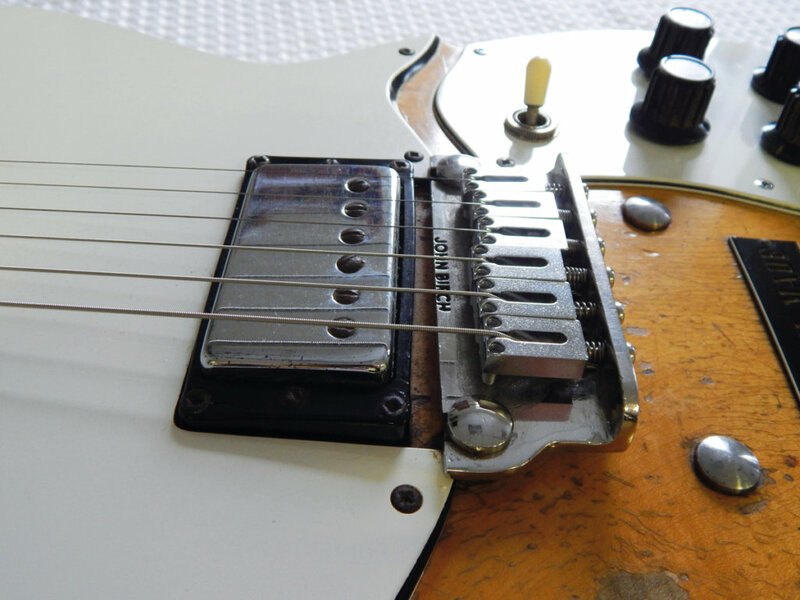 It looks as if both pickups have had their wires joined together with anything that was handy, as they obviously could not reach the control cavity with the original length of wire. 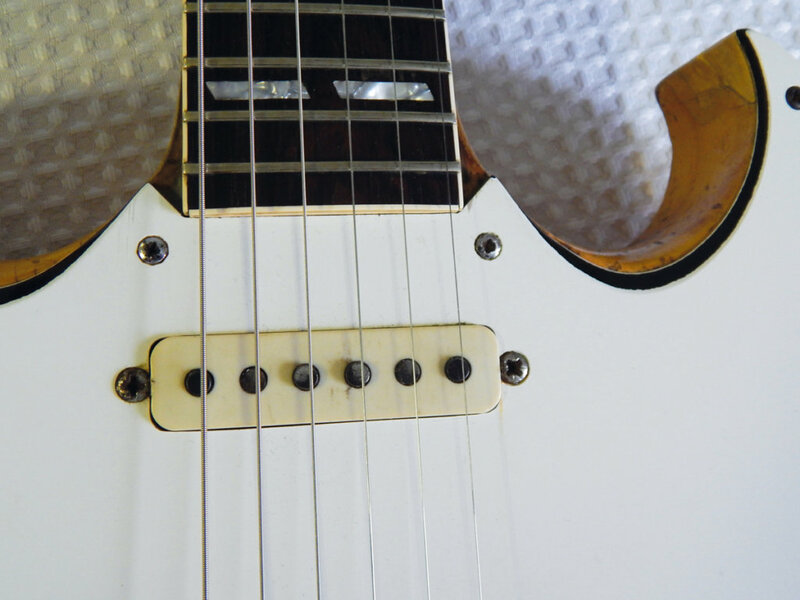 Over the years there have been a number of suggestions and rumours about what these pickups could actually be, so let’s start with the neck pickup. It’s a Fender Jaguar pickup from the post-1965 period, not a Strat pickup, as some have thought. The polepieces are staggered, with the two outer poles flush to the cover, the B and A poles just below the rim of the cover, and the D and G raised higher. 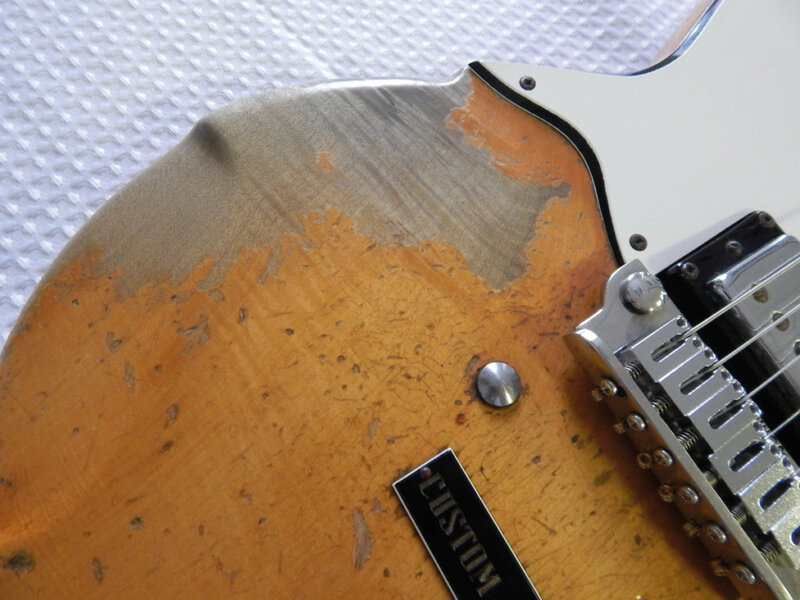 The crucial thing is that the metal ‘claw’ – which is what you would see fitted to the sides of an original Fender Jaguar pickup – has been removed. This claw was used to focus the magnetic field more, not to screen it, and the fact that it’s been taken off is probably the reason that most people have assumed this is a Strat pickup. The tell-tale sign, however, is that the top edges are squared, which is an unmistakable Jaguar trait. These pickups used 42AWG wire with formvar insulation, and the average number of turns was around 8550. Early Jaguar pickups tended to measure around 6.26 ohms, but the pickup on Dave’s guitar measures 6.14 ohms. Moving on to the humbucker, the situation is complicated by the fact that the screws have gone completely rusty. We do have the tools to take them out, but that would mean sacrificing the original screws, and a mere examination really isn’t enough reason to take such a big step. So, it’s certainly best to leave them in – it’s better than ruining them, and having to source sympathetically-aged replacements. Also, there’s a hairline crack on the pickup surround, so even if I did take the pickup out, this old surround may not like it and thus open up. It’s probably been on the guitar since 1968, and discretion seems to be the best path. Still, all is not lost, as I can measure the output from the inside of the guitar. This turns out to be quite this revealing, as the pickup’s resistance measures 7.25 ohms. That is very close to the Gibson T-bucker which started to appear from around ’65 (it has been said that the ‘T’ stands for Treble, and it was embossed on the plastic bobbins to help the installer orient the pickup in the right direction). Also, at around the same time the covers changed to chrome, which is what we find on Dave’s guitar. So, this is no PAF pickup as some have suggested, and one clue is that output. Around 1965-’67 (no-one knows for sure) Gibson changed their manually-run pickup winding system to fully automated, and this resulted in a more consistent 7.3 ohms to 7.5 ohms. These pickups had an A5 alnico magnet which provides more of a chiming, toppy quality. The wood of the guitar absorbs certain frequencies and will resonate others, and the pickups translate the frequencies at which the string is vibrating, which is the whole reason why makers use different woods and hardware to affect the tone. Dave’s guitar with its dense maple body and stainless John Birch bridge would also tend to emphasise the treble, but the rosewood fingerboard and mahogany neck would add just enough of the midrange to give this guitar a unique voice. Listen to any Slade hit, and no explanation will describe what you can hear: it is a unique sound quite unlike any other guitar I know of, and now we know it’s a T-bucker plus a Jaguar pickup, it all begins to make sense. There are many well-known guitars out there, instruments that over the years have become embedded in history by being used on stage and in the studio by famous players, but seeing a one-off guitar such as this with its oddball build and unique hardware in the hands of a dynamic player like Dave Hill is something special. For me, ’70s rock with its classic, pre-overprocessed sound is hard to beat; this guitar produced some of the most memorable riffs of its time, and many thanks to Dave for letting us take a look.